The T-Box (TB) is designed as a low-cost temperature data-logger. A single stand-alone module can acquire, process, and record temperature readings from 100 temperature IC sensors. The TB offers an optional interface to ZigBee networks, for wireless recording and acquisition. It is also available with a range of other industrial control features, an enclosure, and turn-key sample software. Boxed in an extruded aluminum enclosure, the T-Box (TB) is designed as a low cost, portable temperature data logger, or an industrial embedded controller. The T-Box is ideal for distributed temperature sampling. 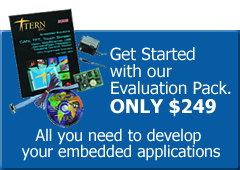 Each board can acquire, process, and record readings from up to 100 low cost temperature IC-sensors. Typical applications for the T-Box include cooler/freezer temperature monitoring, recording, and reporting for food safety applications. The TB can also easily be used in building heating and cooling system control. In addition to processing temperature IC sensors, the T-Box also integrates 24-bit ADCs, RS232/485 serial, Solenoid Drivers, TCP/UDP over Ethernet, ZigBee Wireless, 16×2 lines LCD and CompactFlash for mass temperature data storage. The TB is C/C++ programmable with TERN development platform. Ready to use demo firmware can be loaded into the on-board Flash memory without any development. The TMP275 is a 0.5 degree C accurate, Two-Wire, serial output temperature sensor with a resolution of 0.0625 degree C reading. It is ideal for extended temperature measurement in a variety of communication, computer, consumer, environmental, industrial, and instrumentation applications. Three Address Select Jumpers allow up to 8 devices on the same 2-line I/O bus. The TMP275 is specified for operation over a temperature range of −40 to +125 degree C. The IC Sensor uses 4 pins: VCC, GND, DAT, CLK. Each group of 8 IC temperature sensors can be addressed and read remotely over two I/O lines. The IC-Sensor has 0.5 degree C accuracy over the temperature range of -40C to +125C. A sigma-delta 24-bit ADCs (LTC2448) can be installed to provide 8 ch. differential or 16 ch. single-ended input channels. Variable speed/resolution settings (up to 5 KHz) can be configured. The LTC2448 works well directly with strain gages, current shunts, RTDs, resistive sensors, or 4-20mA current loop sensors, or thermocouples in differential mode. Mass data stored on a local CF card (up to 2 GB) can be easily transferred to a PC. FAT16 file system libraries are provided with the development system. A real time clock (RTC72423) can provide clock/calendar for time stamp usage. A UART (SCC2691) supports RS232, or RS485, or ZigBee wireless. A CPU internal UART is used as RS232 DEBUG port. Three internal timer/counters can be used to count or time external events, or to generate PWM outputs. 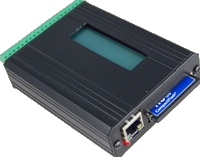 An optional 10/100-baseT Ethernet module or a slave USB port can be installed. A socket interface is available for ZigBee integration, using the Digi XBee wireless radio module (XBee not included). Fourteen PIO lines can be used to drive temperature IC-Sensors, or can be buffered by solenoid drivers. These solenoid drivers are capable of sinking 350 mA at 50V per line, and they can directly drive solenoids, relays, or lights. A 11 ch. 12-bit ADC(TLC2543) can be installed. The TB can use 8.5V to 12V DC power supply with default linear regulator, or up to 30V DC with switching regulator without generating excessive heat, or uses as low as 5.1V-9V battery with low drop regulator (TPS765) installed. A 16×2 line character LCD can be installed. The TB is designed to fit in an aluminum extrusion enclosure.